Article first published as Cherry Tarragon Sorbet on Blogcritics. This sorbet only calls for 5 ingredients. 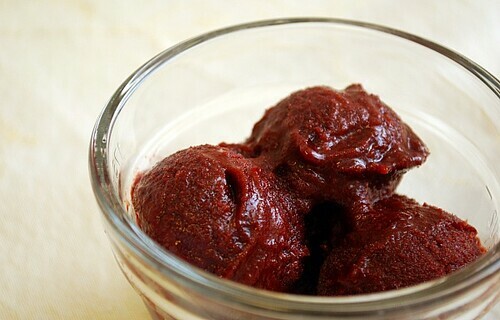 I used fresh cherries for this sorbet and loved the result. Sweet, yet tart and with a slight hint of tarragon. The tarragon gave it a nice herbal touch without being too strong. I was quite surprised how well the tarragon complimented the cherries. The other key ingredient was ground ginger. It added a little depth and balanced the tartness a bit. Who knew fresh herbs and fruit would work so well as a sorbet? I especially liked how this was a perfect palate cleanser after a meal! In a small saucepan, combine the sugar and 13/4 cups water. Bring to a boil and cook until the sugar is dissolved, about 2 minutes. Set aside to cool. Pass the cherries through a food mill or puree in a food processor and then pass them through a fine-mesh sieve. Discard the solids and place the juice in a large bowl. (You should have about 2 cups.) Whisk in the ginger, tarragon, lemon juice and sugar-water mixture. Freeze in an ice-cream maker according to the manufacturer's directions. Looks so refreshing! Cherries are so delicious right now too! Would never have considered that. Looks great! I love herbs and spices in iced desserts -- I'll add this to my list!